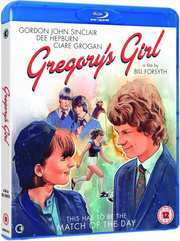 Second Sight have announced the British comedy Gregory's Girl for release this coming 5th May on both Blu-ray and DVD. Directed by Bill Forsyth, this stars John Gordon-Sinclair, Dee Hepburn and Clare Grogan. With new extras that include a commentary track with the director and Mark Kermode, Bill Forsyth: The Early Years interview featurette, Gregory’s Girl Memories interview featurette with Clare Grogan, and alternative US audio soundtrack. The recommended retail price will be £15.99 for the standard definition release and £19.99 for the high def version. Gawky teenager Gregory Underwood, loses his place as striker in the school’s shambolic football team but soon finds comfort with the arrival of new star signing Dorothy. She’s ab-sol-ute-ly gorgeous. He pines to his equally girl-obsessed mates. He sets out to win her heart, but when he finally gets a dream date there’s a surprise in store. It's when I read things like that, I'm amazed they managed to even get past one season if The Wire.